Learn Magic Tricks and How To Do Magic Tricks in the comfort of home! Learn How To Do Magic Tricks!!! This is a super effect where the Magician never touches the cards; still he finds a selected card in the centre of the pack. The Magician asks someone to shuffle a pack of cards, and then to divide the pack into several piles on the table. A spectator is requested to remove a card from the centre of any pile of cards, note the name of card, and replace on the top of any of the piles of cards. The piles of cards are then gathered together and replaced one on top of the other, and the pack can then be cut several times, squared up, and placed on floor. The Magician now reminds the audience that he hasn’t touched the pack of cards, so there can be no question of “Sleight of Hand”, however, he has been practicing some “Sleight of Foot” and with his foot, he kicks the pack, and the cards slide apart. He indicates the card just below the point where the pack breaks most prominently, and he places the toe of his shoe on this cards. As he raises his foot a card is seen to be stuck to the sole of his shoe and this card is found to be the chosen card, which he raises up and shows it to the audience stuck to the toe of his shoe. All that you required for this trick is a small amount of salt in the waistcoat pocket or in any other convenient pocket. 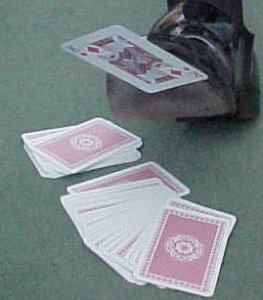 After the pack has been divided into three or four piles on the table, the performer turns his back and asks a spectator to remove any card from any pile, and replace on top of any other pile. Meanwhile, performer places first finger into waistcoat pocket and gets a few grains of salt on to the end of his first finger. The performer then turns around and pointing to piles of cards, he asks spectator on which pile he replaced the chosen card. 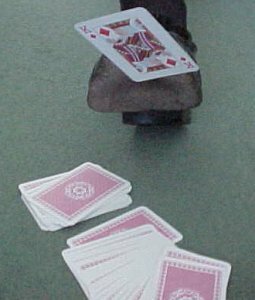 When spectator indicates the pile, the performer places finger on that pile; this move will leave a just a few grains of salt on top of the selected card, but unnoticed by the spectators. SEE FIGURE 1. The spectator is now requested to place a pile on top of the one containing the chosen card, then another pile on top of that, until entire pack is assembled. The Pack may now be cut, and placed on floor. 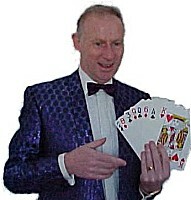 After reminding that audience that the Magician has not touched the cards, he then resorts to his “Sleight of Foot”. - With the side of the shoe, just strike the side of the pack a sharp blow. The cards will slide apart at the point where the salt is. SEE FIGURE 2. 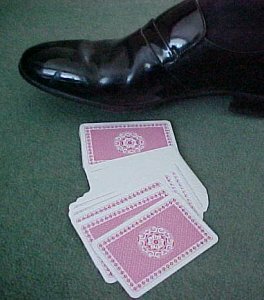 I have just a tiny piece of magician’s wax on the sole of my shoe, right at the toe and when the pack splits to expose the chosen card, I simply place my toe on the card immediately under the split, as if pointing to the card with my foot. SEE FIGURES 3 and 4. However, the little bit of wax is just enough to allow the card to stick to my shoe, and I can then lift my foot to show the selected card. – It’s Real Magic! "Ever Wanted To Know The Secrets of Some Amazing MAGIC TRICKS That Top Magicians Just Won't Tell You?" We despatch ALL CD and DVD orders within 24 hours , and Shipping is FREE. GET YOUR FREE MAGIC eBOOKS NOW! GET IT ALL FREE NOW! - BEFORE IT VANISHES! Do you Want FREE Online MAGIC TRICKS?